Born at Pouy, Gascony, France, in 1580, though some authorities have said 1576; died at Paris, 27 September, 1660. Born of a peasant family, he made his humanities studies at Dax with the Cordeliers, and his theological studies, interrupted by a short stay at Saragossa, were made at Toulouse where he graduated in theology. Ordained in 1600 he remained at Toulouse or in its vicinity acting as tutor while continuing his own studies. Brought to Marseilles for an inheritance, he was returning by sea in 1605 when Turkish pirates captured him and took him to Tunis. He was sold as a slave, but escaped in 1607 with his master, a renegade whom he converted. On returning to France he went to Avignon to the papal vice-legate, whom he followed to Rome to continue his studies. He was sent back to France in 1609, on a secret mission to Henry IV; he became almoner to the Queen Marguerite of Valois, and was provided with the little Abbey of Saint-Léonard-de-Chaume. At the request of M. de Berulle, founder of the Oratory, he took charge of the parish of Clichy near Paris, but several months later (1612) he entered the services of the Gondi, an illustrious French family, to educate the children of Philippe-Emmanuel de Gondi. He became the spiritual director of Mme de Gondi. With her assistance he began giving missions on her estates; but to escape the esteem of which he was the object he left the Gondi and with the approval of M. de Berulle had himself appointed curé of Chatillon-les-Dombes (Bresse), where he converted several Protestants and founded the first conference of charity for the assistance of the poor. He was recalled by the Gondi and returned to them (1617) five months later, resuming the peasant missions. Several learned Paris priests, won by his example, joined him. Nearly everywhere after each of these missions, a conference of charity was founded for the relief of the poor, notably at Joigny, Châlons, Mâcon, Trévoux, where they lasted until the Revolution. After the poor of the country, Vincent's solicitude was directed towards the convicts in the galleys, who were subject to M. de Gondi as general of the galleys of France. Before being convoyed aboard the galleys or when illness compelled them to disembark, the condemned convicts were crowded with chains on their legs onto damp dungeons, their only food being black bread and water, while they were covered with vermin and ulcers. Their moral state was still more frightful than their physical misery. Vincent wished to ameliorate both. Assisted by a priest, he began visiting the galley convicts of Paris, speaking kind words to them, doing them every manner of service however repulsive. He thus won their hearts, converted many of them, and interested in their behalf several persons who came to visit them. A house was purchased where Vincent established a hospital. Soon appointed by Louis XIII royal almoner of the galleys, Vincent profited by this title to visit the galleys of Marseilles where the convicts were as unfortunate as at Paris; he lavished his care on them and also planned to build them a hospital; but this he could only do ten years later. Meanwhile, he gave on the galley of Bordeaux, as on those of Marseilles, a mission which was crowned with success (1625). The good wrought everywhere by these missions together with the urging of Mme de Gondi decided Vincent to found his religious institute of priests vowed to the evangelization of country people--the Congregation of Priests of the Mission. Experience had quickly revealed to St. Vincent that the good done by the missions in country places could not last unless there were priests to maintain it and these were lacking at that time in France. Since the Council of Trent the bishops had been endeavoring to found seminaries to form them, but these seminaries encountered many obstacles, the chief of which were the wars of religion. Of twenty founded not ten had survived till 1625. The general assembly of the French clergy expressed the wish that candidates for Holy Orders should only be admitted after some days of recollection and retreat. At the request of the Bishop of Beauvais, Potierdes Gesvres, Vincent undertook to attempt at Beauvais (September, 1628) the first of these retreats. According to his plan they comprised ascetic conferences and instructions on the knowledge of things most indispensable to priests. Their chief service was that they gave rise to the seminaries as these prevailed later in France. At first they lasted only ten days, but in extending them by degrees to fifteen or twenty days, then to one, two, or three months before each order, the bishops eventually prolonged the stay of their clerics to two or three years between philosophy and the priesthood and there were what were called seminaries d'ordinands and later grands seminaries, when lesser ones were founded. No one did more than Vincent towards this double creation. As early as 1635 he had establish a seminary at the Collége des Bons-Enfants. Assisted by Richelieu, who gave him 1000 crowns, he kept at Bons-Enfants only ecclesiastics studying theology (grand seminarie) and he founded besides Saint-Lazare for young clerics studying the humanities a lesser seminary called the Seminary of St. Charles (1642). He had sent some of his priests to the Bishop of Annecy (1641) to direct his seminary, and assisted the bishops to establish others in their dioceses by furnishing priests to direct them. At his death he had thus accepted the direction of eleven seminaries. Prior to the Revolution his congregation was directing in France fifty-three upper and nine lesser seminaries, that is a third of all in France. The ecclesiastical conference completed the work of the seminaries. Since 1633 St. Vincent held one every Tuesday at Saint-Lazare at which assembled all the priests desirous of conferring in common concerning the virtues and the functions of their state. Among others Bossuet and Tronson took part. With the conferences, St. Vincent instituted at St-Lazare open retreats for laymen as well as priests. It is estimated that in the last twenty-five years of St. Vincent's life there came regularly more than 800 persons yearly, or more than 20,000 in all. these retreats contributed powerfully to infuse a Christian spirit among the masses, but they imposed heavy sacrifices on the house of St-Lazare. Nothing was demanded of the retreatants; when there was question of the good of souls Vincent thought little of expense. At the complaints of his brethren who desired that the admission of the retreatants should be made more difficult he consented one day to keep the door. Towards evening there had never been so many accepted and when the embarrassed brother came to inform him that there was no more room he merely replied "well, give mine". 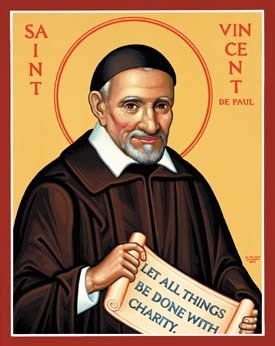 Vincent de Paul had established the Daughters of Charity almost at the same time as the exercises des ordinands. At first they were intended to assist the conferences of charity. When these conferences were established at Paris (1629) the ladies who joined them readily brought their alms and were willing to visit the poor, but it often happened that they did not know how to give them care which their conditions demanded and they sent their servants to do what was needful in their stead. Vincent conceived the idea of enlisting good young women for this service of the poor. They were first distributed singly in the various parishes where the conferences were established and they visited the poor with these ladies of the conferences or when necessary cared for them during their absence. In recruiting, forming, and directing these servants of the poor, Vincent found able assistance in Mlle Legras. When their number increased he grouped then into a community under her direction, coming himself every week to hold a conference suitable to their condition. (For further details see Sisters of Charity.) Besides the Daughters of Charity Vincent de Paul secured for the poor the services of the Ladies of Charity, at the request of the Archbishop of Paris. He grouped (1634) under this name some pious women who were determined to nurse the sick poor entering the Hotel-Dieu to the number of 20,000 or 25,000 annually; they also visited the prisons. Among them were as many as 200 ladies of the highest rank. After having drawn up their rule St. Vincent upheld and stimulated their charitable zeal. It was due to them that he was able to collect the enormous sums which he distributed in aid of all the unfortunates. Among the works, which their co-operation enabled him to undertake, that of the care of foundlings was one of the most important. Some of the foundlings at this period were deliberately deformed by miscreants anxious to exploit public pity. Others were received into a municipal asylum called "la couche", but often they were ill-treated or allowed to die of hunger. The Ladies of Charity began by purchasing twelve children drawn by lot. who were installed in a special house confided to the Daughters of Charity and four nurses. Thus years later the number of children reached 4000; their support cost 30,000 livres; soon with the increase in the number of children this reached 40,000 livres. With the assistance of a generous unknown who placed at his disposal the sum of 10,000 livres, Vincent founded the Hospice of the Name of Jesus, where forty old people of both sexes found a shelter and work suited to their condition. This is the present hospital of the uncurables. The same beneficence was extended to all the poor of Paris but the creation of the general hospital which was first thought of by several Ladies of Charity, such as the Duchesse d'Aiguillon. Vincent adopted the idea and did more than anyone for the realization of what has been called one of the greatest works of charity of the seventeenth century, the sheltering of 40,000 poor in an asylum where they would be given a useful work. In answer St. Vincent's appeal the gifts poured in. The king granted the lands of the Salpétriere for the erection of the hospital, with a capital of 50,000 liveres and an endowment of 3000; Cardinal Mazarin sent 100,000 livres as first gift, Président de Lamoignon 20,000 crowns, a lady of the Bullion family 60,000 livres. St. Vincent attached the Daughters of Charity to the work and supported it with all his strength. St. Vincent's charity was not restricted to Paris, but reached to all the provinces desolated by misery. In that period of the Thirty Years War known as the French period, Lorraine, Trois-Evechés, Franche-Comté, and Champagne underwent for nearly a quarter of a century all the horrors and scourges which then more than ever war drew in its train. Vincent made urgent appeals to the Ladies of Charity; it has been estimated that at his reiterated requests he secured 12,000 livres equivalent to $60,000 in our time (1913). When the treasury was empty he again sought alms which he dispatched at once to the stricken districts. When contributions began to fail Vincent decided to print and sell the accounts sent him from those desolated districts; this met with great success, even developing a periodical newspaper called "Le magasin charitable". Vincent took advantage of it to fund in the ruined provinces the work of the potages économiques, the tradition of which still subsists in our modern economic kitchens. He himself compiled with minute care instructions concerning the manner of preparing these potages and the quantity of fat, butter, vegetables, and bread which should be used. He encouraged the foundation of societies undertaking to bury the dead and to clean away the dirt which was a permanent cause of plague. They were often headed by the missionaries and the Sisters of Charity. Through them also Vincent distributed to their land. At the same time, in order to remove them from the brutality of the soldiers, he brought to Paris 200 young women whom he endeavored to shelter in various convents. and numerous children whom he received at St-Lazare. He even founded a special organization for the relief of the nobility of Lorraine who had sought refuge in Paris. After the general peace he directed his solicitude and his alms to the Irish and English Catholics who had been driven from their country. All these benefits had rendered the name of Vincent de Paul popular in Paris and even at the Court. Richelieu sometimes received him and listened favorably to his requests; he assisted him in his first seminary foundations and established a house for his missionaries in the village of Richelieu. On his deathbed Louis XIII desired to be assisted by him: "Oh, Monsieur Vincent", said he, "if I am restored to health I shall appoint no bishops unless they have spent three years with you." His widow, Ann of Austria, made Vincent a member of the council of conscience charged with nominations to benefices. These honors did not alter Vincent's modesty and simplicity. He went to the Court only through necessity, in fitting but simple garb. He made no use of his influence save for the welfare of the poor and in the interest of the Church. Under Mazarin, when Paris rose at the time of the Fronde (1649) against the Regent, Anne of Austria, who was compelled to withdraw to St-Fermain-en-Laye, Vincent braved all dangers to go and implore her clemency in behalf of the people of Paris and boldly advised her to sacrifice at least for a time the cardinal minister in order to avoid the evils which the war threatened to bring on the people. He also remonstrated with Mazarin himself. His advice was not listened to. St. Vincent only redoubled his efforts to lessen the evils of the war in Paris. Through his care soup was distributed daily to 15,000 or 16,000 refugees or worthy and poor; 800 to 900 young women were sheltered; in the single parish of St. Paul the Sisters of Charity made and distributed soup every day to 500 poor, besides which they had to care for 60 to 80 sick. During this time Vincent, indifferent to dangers which he ran, multiplied letters and visits to the Court at St-Denis to win minds to peace and clemency; he even wrote a letter to the pope asking him to intervene and to interpose his mediation to hasten peace between the two parties. Jansenism also made evident his attachment to the Faith and the use to which he put his influences in its defense. When Duvergier de Hauranne, later celebrated as the Abbé de St-Cyran, came to Paris (about 1621), Vincent de Paul showed some interest in him as in a fellow countryman and a priest in whom he discerned learning and piety. But when he became better acquainted with the basis of his ideas concerning grace, far from being misled by them, he endeavored to arrest him in the path of error. When the "Augustinus" of Jansenius and "Frequent Communion" of Arnauld revealed the true ideas and opinions of the sect, Vincent set about combating; he persuaded the Bishop of Lavaur, Abra de Raconis, to write against them. In the Council of Conscience he opposed the admission to benefices of anyone who shared them, and joined the chancellor and the nuncio in seeking means to stay their progress. Stimulated by him some bishops at St-Lazare took the initiative in relating these errors to the pope. St. Vincent induced 85 bishops to request the condemnation of the five famous propositions, and persuaded Anne of Austria to write to the pope to hasten his decision. When the five propositions had been condemned by Innocent X (1655) and Alexander VII (1656), Vincent sought to have this sentence accepted by all. His zeal for the Faith, however, did not suffer him to forget his charity; he gave evidence in behalf of St-Cyran, whom Richelieu had imprisoned (1638), and is said to have assisted at his funeral. When Innocent X had announced his decision he went to the solitaries of Port-Royal to congratulate them on the intention they had previously manifested of submitting fully; he even begged preachers renowned for their anti-Jansenist zeal to avoid in their sermons all that might embitter their adversaries. The religious orders also benefited by the great influence of Vincent. Not only did he long act as director to the Sisters of the Visitation, founded by Francis de Sales, but he received at Paris the Religious of the Blessed Sacrament, supported the existence of the Daughters of the Cross (whose object was to teach girls in the country), and encouraged the reform of the Benedictines, Cistercians, Antonines, Augustinians, Premonstratensians, and the Congregation of Grandmont; and Cardinal de Rochefoucault, who was entrusted with the reform of the religious orders in France, called Vincent his right hand and obliged him to remain in the Council of Conscience. Vincent's zeal and charity went beyond the boundaries of France. As early as 1638 he commissioned his priests to preach to the shepherds of the Roman Campagna; he had them give at Rome and Genoa the exercices des ordinands and preach missions on Savoy and Piedmont. He sent others to Ireland, Scotland, the Hebrides, Poland, and Madagascar (1648-60). Of all the works carried on abroad none perhaps interested him so much as the poor slaves of Barbary, whose lot he had once shared. These were from 25,000 to 30,000 of these unfortunates divided chiefly between Tunis, Algiers, and Bizaerta. Christians for the most part, they had been carried off from their families by the Turkish corsairs. They were treated as veritable beasts of burden, condemned to frightful labour, without any corporal or spiritual care. Vincent left nothing undone to send them aid as early as 1645 he sent among them a priest and a brother, who were followed by others. Vincent even had one of these invested with the dignity of consul in order that he might work more efficaciously for the slaves. They gave frequent missions to them, and assured them the services of religion. At the same time they acted as agents with their families, and were able to free some of them. Up to the time of St. Vincent's death these missionaries had ransomed 1200 slaves, and they had expended 1,200,000 liveres in behalf of the slaves of Barbary, not to mention the affronts and persecutions of all kinds which they themselves had endured from the Turks. This exterior life so fruitful in works had its source in a profound spirit of religion and in an interior life of wonderful intensity. He was singularly faithful to the duties of his state, careful to obey the suggestions of faith and piety, devoted to prayer, meditation, and all religious and ascetic exercises. Of practical and prudent mind, he left nothing to chance; his distrust of himself was equalled only by his trust in Providence; when he founded the Congregation of the Mission and the Sisters of Charity he refrained from giving them fixed constitutions beforehand; it was only after tentatives, trials, and long experience that he resolved in the last years of his life to give them definitive rules. His zeal for souls knew no limit; all occasions were to him opportunities to exercise it. When he died the poor of Paris lost their best friend and humanity a benefactor unsurpassed in modern times. Forty years later (1705) the Superior-General of the Lazarists requested that the process of his canonization might be instituted. Many bishops, among them Bossuet, Fénelon, Fléchier, and Cardinal de Noailles, supported the request. On 13 August, 1729, Vincent was declared Blessed by Benedict XIII, and canonized by Clement XII on 16 June, 1737. In 1885 Leo XIII gave him as patron to the sisters of Charity. In the course of his long and busy life Vincent de Paul wrote a large number of letters, estimated at not less than 30,000. After his death the task of collecting them was begun; in the eighteenth century nearly 7000 had been gathered; many have since been lost. Those which remained were published rather incorrectly as "Lettres et conferérences de s. Vincent de Paul" (supplement, Paris, 1888); "Lettres inédites de saint Vincent de Paul" (Coste in"Revuede Gascogne", 1909, 1911); Lettres choisies de saint Vincent de Paul" (Paris, 1911); the total of letters thus published amounts to about 3200. There have also been collected and published the saint's "Conférences aux missionaires" (Paris, 1882) and "Conférences aux Filles de la Charite" (Paris, 1882).